The dark side of reading? You can read more from Schopenhauer’s essay ‘On Reading and Books’. I have also found that after finishing a book with a strong idiosyncratic voice (of author or narrator or protagonist), my thoughts are colored by that voice for a while afterwards. I always thought that was kind of a neat after-effect, but Schopenhauer gives it a creepy new angle: letting someone else think for me! But Schopenhauer doesn’t glorify reading; in fact, quite the opposite. He thunders on about people who have “read themselves stupid” (by too much reading and too little thinking). Only some books are worth reading, and those are worth re-reading, a lot. … But I do get his point about the importance of reflection. Maybe writing little book reviews of the books I read is not enough. Maybe, instead of dashing on immediately to the next book (or another one of the five I have going simultaneously), I could benefit more from chewing over the completed book a bit more and determining how it connects with other things I’ve read, seen, or heard, and my own life. It’s hard not to compare Schopenhauer’s views to those of Mortimer Adler, as in his How to Read a Book book. He, too, opined that most books were not worth reading, with some few very valuable exceptions. He advocated engaging directly with the text, including the controversial practice of writing in the book (hooray!). To Adler, the highest level of reading was “syntopical reading,” in which you identify themes and how they connect across books to allow you to place the current book within the wide world of ideas and concepts — a very deep form of reflection and analysis. But he did not share Schopenhauer’s negative characterization of the act of reading (even if he was rather prescriptive in his approach to it). I use goodreads to review books as I read them (and to keep track of all the wonderful new books I discover that I absolutely MUST read in the future). As a result, several of my friends have recently started commenting on my reading activity and wondering how I manage to read so much. I don’t think it is “so much,” especially since reading is an incredible form of entertainment and escapism, really more of a guilty pleasure than any kind of virtue. :) But it is true that I have been reading more lately than I had in the past, and (like anything else) it is a combination of making it a priority and making it a habit. I just came across a fabulous article by Ali Binazir that sums up a lot of my views far better than I ever could, and also includes some great tips if you would like to increase your own reading. Unlike some other advice about increasing reading activity, Ali emphasizes that it isn’t a race and that it is a “joy and a privilege” to live in a time when we have an astonishing level of access to books and the leisure time to enjoy them (yes, we do). According to this article, the average (median) American reads 4 books each year. Four!! I read 80 books last year and am gunning for more in 2019. In that context, I guess it does seem like I read “so much.” But the more I read, the more I find that my appetite for reading increases (bookbeast!). Where do you draw the line between an enjoyable hobby and an addiction? For me personally, I read during meals. This has the slight downside of making me less aware of my food (and there are several good reasons to be more mindful when you’re eating), but it guarantees me timeslices every day in which I get to read. I also read in the evening to unwind, and often I read right before bed. The anticipation of getting to read a good book helps me drag myself away from my phone or computer and do something without screens before falling asleep, which is supposed to help you sleep better. I also alternate between several different books rather than pursuing one to the end before starting the next. I seem to have a strong desire for diversity; it is like nibbling at all sorts of different treats at a buffet. I agree with Ali, too, that some books are better choices than others for pre-bedtime reading, so it’s good to have several currently-reading books to choose from, depending on the time of day and your mood. I do occasionally consume audiobooks, as Ali suggests, but they take longer than visual reading and they are less available than the cornucopia of things I want to read in physical form at the library (or in stacks at my house). During my commutes, I mostly listen to podcasts, which can feel like a book (e.g., This American Life), but more often are thought-provoking bits that make up the bulk of my non-fiction consumption. Most of my pleasure reading has been fiction of late (although I feel some desire to change that up and get more non-fiction into my diet). Also as Ali mentions, having a goal is motivating. I use the Goodreads “reading challenge” to declare a target number of books to read in a given year, and I do find that it motivates me. I make myself write up a short review of each book I read, which takes discipline (often I am just eager to pick up the next book), but it is very valuable for going back later to refresh my memory, or just to solidify what I got out of the book (especially non-fiction). It’s amazing how very much we forget! What are your tips and strategies and habits for reading? Do share! Daniel Kahneman gave a fascinating talk about two kinds of happiness: the happiness you experience in the moment, and the happiness you feel when remembering an event later. This idea got inside my head and wouldn’t go away. Basically, studies have shown that people will report very different levels of pain or pleasure while they are having an experience, compared to what they report looking back on it later. I take this to mean that not only is happiness subjective (per person), but it is also a function of time. Or, another way to see it is to realize that the person you are changes over time. We may know this already, but it is inconvenient and disorienting and at odds with the illusion of a constant self, so we tend to forget it and move on with our lives. Imagine that for your next vacation, you know that at the end of the vacation all your pictures will be destroyed, and you’ll get an amnesic drug so that you won’t remember anything. Now, would you choose the same vacation? Another observation he shared is that one’s later reflection on an experience is most influenced by how it ended. A positive or pleasant ending colors the entire experience, and the same is true if the end is painful or unpleasant. Remembered happiness is clearly *not* the integral of momentary happiness. But if this is true, what does it mean for people who seek happiness? Which kind of happiness is the one you want to optimize? If you optimize happiness in the moment, arguably you are happier for more of the total time. But you might not *feel* that way, looking back later. If there were unpleasant bits near the end of an experience, they could dwarf all of the intermediate pleasure. But if you optimize retrospective happiness, this could come at the cost of a lot of momentary pain and unhappiness (which you later forget). Which self do you care more about? Since the remembering self is the one who lives on (the momentary self is arguably dead after the moment passes), maybe that self should win. What’s a person to do? Kahneman did not answer this question. He also didn’t address the fact that the remembering self, each time it remembers, updates and reinforces and alters the memories slightly, so ultimately happiness is a fluid quantity that won’t sit still even if you were to stop having new experiences. It’s possible that Kahneman has gotten me to way over-think this question. And yet I can’t quite let it go. The pursuit of happiness and a good life is the fundamental question of philosophy and living. With this idea, Kahneman has also pointed out that it is also inextricably tied to identity. Which self is *me*? Both. But I can only live one life. Hmmm! 1 of 1 people learned something from this entry. On a recent drive across the desert from California to Arizona, I decided to stop and see the Blythe airport. I had flown over it, but never landed and visited. To my delight, as I rolled up in my car, I discovered that the Goodyear blimp had just landed! Later when I was back at a computer, I wanted to find out more about these blimps and how they work. Apparently Goodyear got into the lighter-than-air business in 1898, and in 1925 they flew the first blimp that used helium. Mostly they seem to have been used for advertising, and not just for their own tires. Some blimps have lighted panels on their sides where they can spell words or scroll messages; in 1966 they added the “Skytacular” which was in 4 colors and had animations; now they have “Eaglevision” which uses high-res LEDs and can show video :). I’ve never seen one in operation scrolling messages! In WWII, they were used for patrolling the ocean (escorting navy convoys). I don’t know if they had any weapons. The Goodyear blimps use helium, which has about the same lifting force as hydrogen, but with the added benefit of not being explosive. The infamous Hindenburg disaster occurred when the (German) Hindenburg, which was also designed for use with helium, was instead filled with hydrogen, apparently because the U.S. was monopolizing helium for its own use, and helium had become correspondingly expensive internationally. The Hindenburg had 97 people onboard when it ignited in 1937 (36 died). We actually have stunning real footage of the Hindenburg coming in to land and blowing up (!). 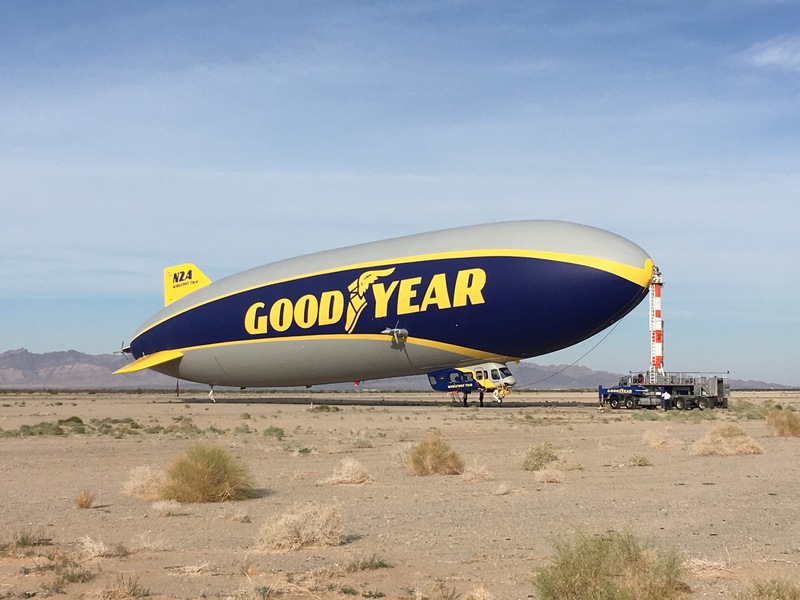 What Goodyear flies now is not technically a blimp (!) (“blimp” = no rigid structure) but instead a “semi-rigid airship” or “zeppelin”. (The Hindenburg was a third type of airship: fully rigid). However, Goodyear still encourages the use of the term “blimp.” Its max speed is 73 mph (not bad! ), and it seats up to 14 people. Today’s Goodyear blimps are 246 feet long, compared with 804 feet (!) for the Hindenburg. “Intermittent” is the tricky one. There are five options shown by the horizontal white bars. Do they indicate how frequently the wipes happen? 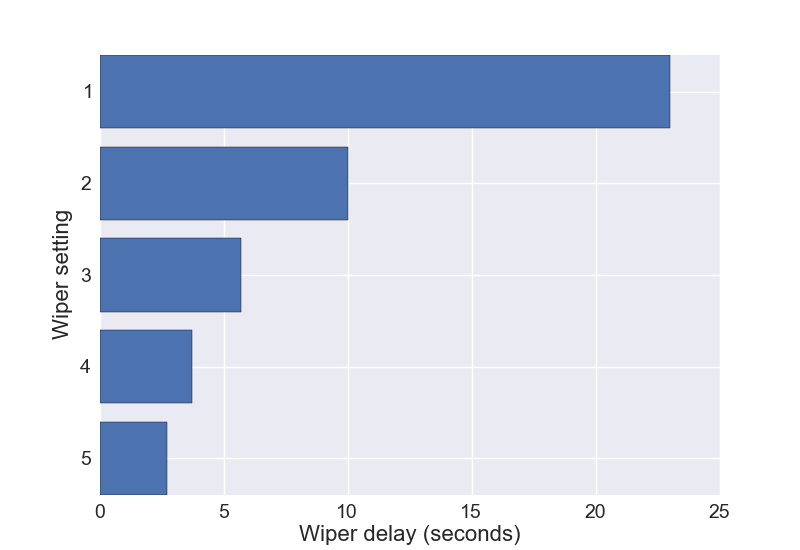 Or do they indicate the delay between wipes? Effectively, in which direction does the scale increase? I can never remember this, so every time I end up trying out different settings to re-learn how to use my wipers. In this case, a bigger white bar (bottom) means more frequent wipes, which is the reverse of the order implied by “HI” being on top. And what’s up with the exponential growth implied by the white bars? Is that real? Boo, Chevrolet designers! And especially for inverting the order with respect to the “LO” and “HI” markings. 5 of 5 people learned something from this entry.